From mystery and suspense to science fiction and thrillers, the best of books can move a reader to a new world familiar or unfamiliar. David Michael Martin graduated from the Ohio Institute of Technology in 1982 and designed PC-integrated laboratory analyzers. An avid science fiction and fantasy reader, David successfully told engaging and entertaining stories as a games master for several of the popular fantasy-roleplaying game systems appearing today. David returned to college and pursued his interests in English and the humanities at Ohio University and Adams State University. David has over twenty years’ experience tutoring adult basic education classes for adult students seeking their G.E.D. diplomas. 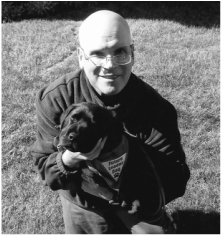 David currently lives in western Michigan and is training puppies to be leader dogs for the blind. Hunter's Moon is his first novel. Kidahin, of the Eyloni, is on her first mission since her adulthood ceremony when her ship, Hunter’s Moon, is attacked. The ship suffers major damage and the crew suffers the devastating loss of its Warleader. 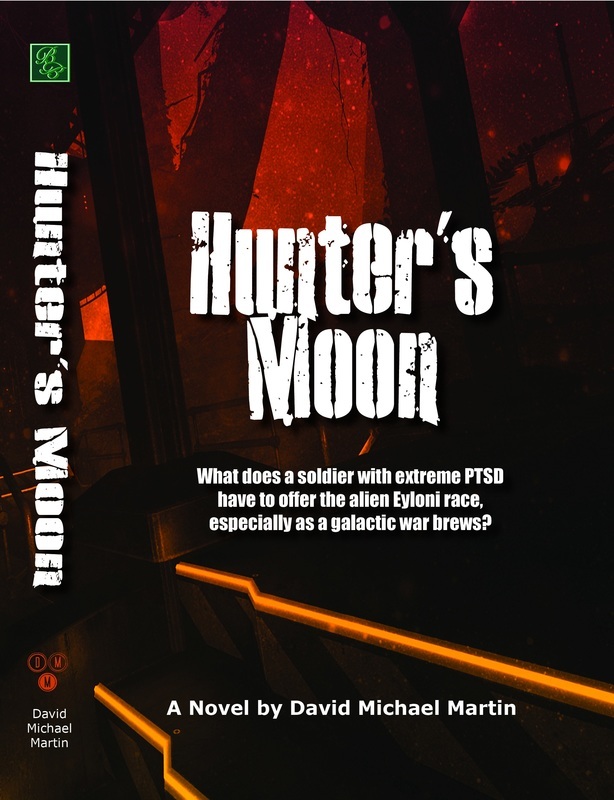 While making repairs at a nearby moon, Kidahin’s youthful hubris gets her into trouble when she attempts to track a human: Chief Warrant Officer Del Marsch, a topnotch soldier and training officer. Marsch, a hardened veteran, whose family has been senselessly murdered by the brutal Ni’zakhonii, suffers from extreme PTSD, with flashbacks powerful enough he can smell them. But a war is brewing and soldiers must be trained, even on a ship whose current mission is a diplomatic one. Aboard the Henri Edda, Marsch is the best one for the job – until he inadvertently offers to train a young alien. March’s agreement with the Mistress of Hunter’s Moon to take the inexperienced Kidahin under his wing infuriates Ambassador Harrison, primary human liaison to the Eyloni. He’s positive this arrangement could drive a wedge into the diplomatic relationship. But the power-hungry diplomat knows little of the culture of the Eyloni - and even less about the Ni’zakhonii. Tensions reach the breaking point when Marsch, compelled to mount a rescue when the Ni’zakhonii capture a group of Eyloni, must make life-changing decisions, even as Harrison is branding him a traitor. In the 80's and 90's Michele remodeled an old house in Denver, invented a career, and did her best to change the world through politics. A passionate advocate for personal liberty and fiscal responsibility, Michele helped create the original Tea Party: The Glendale Tea Party. 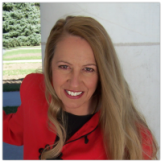 In 2002, she published her first non-fiction book, Creating a Successful Convention. 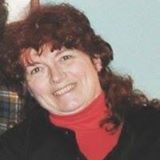 After many years of crafting the story in her ﻿mind and then finally having the time to write it, in 2011-2013 she published an epic science fiction trilogy, The Healing Crystal, Book 1: Heir to Power, Book 2: Fall of Eden, Book 3: Ransom.Her fourth novel, The Candy Store was published by Bent Briar in August 2015. Her fifth novel, a ghost story, will be published in 2019. ​the future or the past? Sunday is part of the blogging staff at A Book A Day Reviews. Her passion is hard science fiction though she strolls into an occasional “Lord of the Rings”. She enjoys reading mysteries and what she terms as throw-away books. These are books you read quickly and pass on to others. Her favorite writer in this genre is Janet Evanovich but she does admit to keeping some on her shelf anyway. To see more about Sunday, go to A Book A Day Reviews. Bent Briar is pleased to be working with Sunday Smith on her new project, a story of how child abuse has infected, not just the grownup version of the child but her relationships too. The book’s focus is on how past memories can affect how one deals with current abusive relationships. This tale, based on a true story, is told with intensity and clarity. Eva left college with a Bachelor of Fine Arts degree from the University of Massachusetts (Amherst) but spent most of her working life in Customer Service, Faculty Support and Operations Coordination in retail (Sears), academia (MIT) and network operations (BBN-now GTE). After moving to Colorado in 1991, she went back to her art roots and ran an artists' services company (A Slice of Time) for 10 years. Her background gives her a strong interest in how large organizations and governments operate effectively (or don't). She's an avid (some say compulsive) gardener and these two interests are merging in the book she's working on at present, "A Gardener's Guide to Politics." She's also been a book reviewer at A Book a Day Reviews since 2011. Watch for Eva's book, to be published by Bent Briar.